Reproduced with the kind permission of EETime, who retain the copyright of this article. Founded in 2005 to develop and license its own architecture of low-power processor cores and associated development tools, Andes is still privately held but has received significant minority investment from fabless chip company MediaTek Inc. (Hsinchu,Taiwan). MediaTek is also a licensee. Although Andes may not be well known in Europe it has achieved design wins in numerous wireless connectivity chips and touchscreen controllers and Andes IP has shipped in more than a billion chips to date. Having started in southeast Asia before ramping commercial activities in the United States, Lin now reckons the suitability of the company’s AndeStar architecture for low-power nodes in the Internet of Things (IoT) makes it a good fit for European developers. EETE: What differentiates Andes Technologies processor cores from those of other suppliers such as ARM, Imagination (MIPS), Synopsys (ARC) or Cadence (Tensilica)? Frankwell Lin: “The AndesCore series comes with differentiations such as CoDense for very compact code size, StackSafe for automatic detection of stack overflow, PowerBrake for a purely digital way to scale frequency and power without a clock divider, FastWakeUp for Automatic CPU state save/restore for fast power-down/power-up, Andes Custom Extension (ACE) for programmable acceleration and energy reduction through the use of custom instructions, Security for Protection against software attacks and physical attacks, and FlashFetch, which is separate IP to speed up internal Flash and allow execute-in-place external Flash support. Frankwell Lin, CEO and co-founder of Andes. EETE: What about voltage scaling for low power? Andes can also support dynamic voltage and frequency scaling (DVFS), Lin said but that requires foundry support as well as hard IP assistance. Andes is close to the leading edge of manufacturing processes for deployment with designs aimed at 16nm FinFET in development and 20nm and 28nm CMOS chips in production, he added. Andes is also familiar with the low-voltage process variants being produced by TSMC and other foundries. 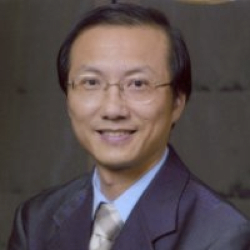 “Five years ago we started working with TSMC on a super low voltage 55nm process. 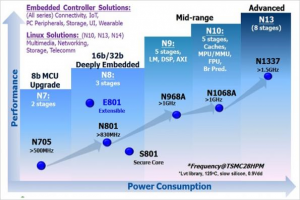 We applied our N8 core and had it running at 0.48V in 55nm CMOS,” said Lin. EETE: What markets are Andes cores suitable for? FL: “We provide deeply embedded controllers for 32 bit MCU, IoT, artificial intelligence, multimedia, virtual reality, touch panel controller, deep learning, ADAS, housekeeping controller, cloud computing controller, networking, video codec, timing controller, event recorder, wireless charging; wireless connectivity WiFi/BT/GPS, Zigbee and Near Field Communications NFC, for security application such as Security SD controller, Security USB controller; flash-based storage controller in solid-state drives, memory card controllers, USB drives, sensor hubs; and wireless displays such as 8K4K TV encoder, 4K2K TV codec, H.264/H.265 codec and so on,” Lin said. “Andes is good for all embedded and deeply embedded applications and we have an open ecosystem and third-party support. But for things like Apple iOS and Android applications we are far behind,” Lin added. EETE: When will Andes bring out a 64-bit processor core? FL: Lin accepted that Andes customers are starting to get close to a requirement for 64-bit addressing capability. “Our licensees are gaining design wins in novel applications areas such as virtual reality, artificial intelligence and embedded vision. Our 64-bit core will be backwards compatible with our 32-bit cores. We already have a basic scenario but it is too early to disclose,” Lin said. He added that engineers should not expect to see a 64-bit core from Andes in 2016. EETE: Is lower cost of upfront licensing fees and royalty rates another differentiator for Andes? FL: “We offer value with our technical solutions. Our price may be a strength, but it should be the last thing we discuss. Our customers ask about our technical features first,” Lin responded. EETE: How many core families are there and is there software compatibility across the range? series: N7, N8, N9, N10, N13, E8, S8, D10, and we maintain their software backward compatibility, for example, our third generation ISA v3 can run the prior generation ISA v2,” said Lin. The S8 and E8 are based on the three-stage pipeline of the N8 core. The S8 family is a secure processor that protects code and data from physical attacks and malicious debugging. The E8 family targets IoT applications by allowing the creation of custom instructions to increase performance and reduce power consumption of key functions. The D10, introduced in 2015 is based on the 5-stage pipeline of the N10 and adds single-instruction multiple data (SIMD) capabilities to the core. EETE: And do you provide support for multi-core designs such as dual- or quad-core configurations? FL: “We have customers who leverage our technology to do many-core designs in their application. For a 4K encoder there is a design that uses three N13s and five N10s. There are quite a few examples like this,” said Lin. EETE: How is the Andes range supported in terms of compilers and third-party tools? FL: “Our toolchain is GNU based, including compilers. In terms of third-party tools, Lauterbach, IAR Systems, support us, as do J&D with a product called CodeViser (a software debugger) and CooCox with a GNU-based integrated development environment. EETE: What next for the company in terms of IP? Do you need to add graphics, or wireless IP? EETE: How successful has Andes been in terms of chips sold that have included Andes IP? EETE: How will you achieve success in Europe? FL: “Europe is strong in mixed-signal design, in RF and low power design – these are the key elements in IoT and we expect Europe to be a leader in IoT. With low power, high code density and support for wireless standards such as Bluetooth, Zigbee and more Andes processor cores are ideal for the IoT market,” said Lin.